I commented the other day that we hadn’t been to Marineland the previous few years. One of the reasons is that we were going to Safari Niagara instead. The kids love seeing the animals, and the play park and splash pad are fantastic. We probably went 7 or 8 times last year. I took some pictures of our visit last August. Most of the pictures are of the bird show, but there are a few others. As always, you can see some of the thumbnails below, and you can see the rest of the thumbnails and the larger images in the Safari Niagara in August 2011 gallery. As a side note, the Niagara Falls Image Gallery now has 3399 images in 265 categories. I also took a couple of videos. The first one is of the Birds of Prey show. You can see a few of the birds, including one that is “hunting”. You can watch this HD video on YouTube or see it below. Last week I received this email newsletter from Safari Niagara. I know it’s late, and the date says the sale ends January 6th, but if it is like last year, they will keep offering the same deal for a while. If anyone does call and finds out whether the deal is still on or not, let me know. Safari Niagara Receives Business Excellence Award! 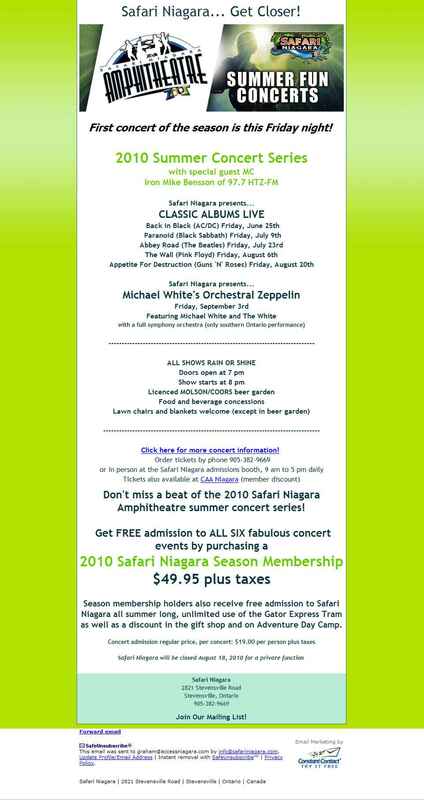 A couple of weeks ago I received the following email newsletter from Safari Niagara. To subscribe to “Yak It Up”, the Safari Niagara newsletter, click on the subscribe link at the top of any page. On Tuesday I received the following email newsletter from Safari Niagara. I’m pretty sure I’ll be there on Saturday. Note: I was going through some of my draft posts, and found that I had this post essentially all done, but never did post it. It is from some of the trips we took last year to Safari Niagara. I still wanted to post it as there are some nice pictures and a good HD video of the giraffes and hippos. Prior to 2010, I had only been to Safari Niagara (formerly Zooz) twice. We had gone in the Summer of 2002. I didn’t realize it until now, but it had just opened in May of that year. We also went in December of 2004. The zoo itself wasn’t open, but they had a special Christmas hay ride where they had the Heat Miser, the Snow Miser, and Santa around the zoo. Boy, how things have changed in the intervening six years. All I remember from that first trip was the bird area and how they had lots of space. This year, they still have lots of space, but it actually has a lot of animals now. There are birds, flamingos, deer, moose, tigers, lions, giraffe, hippopotamus, monkeys, and more. Other than the animals, there are lots of other things to do as well. There is a huge playground, a large splash pad, a “lake” to fish in, an area to play volleyball or badminton, giant chess and checkers, as well as paddle boats. When we were there in 2010, I took a bunch of pictures. You can see some of the thumbnails below, and you can see all of the images in their full size in the Safari Niagara in Summer 2010 gallery. Here is a map of Safari Niagara. I took a video of the giraffes and hippos. You can see the Hippos and Giraffes at Safari Niagara in Summer 2010 video on YouTube or below. I also took a video of some of the bird show at Safari Niagara. You can see the Safari Niagara Bird Show in Summer 2010 video on YouTube or below. Lastly, I also took a video of some of the other animals and birds at Safari Niagara. You can see the Animals at Safari Niagara in Summer 2010 video on YouTube or below. 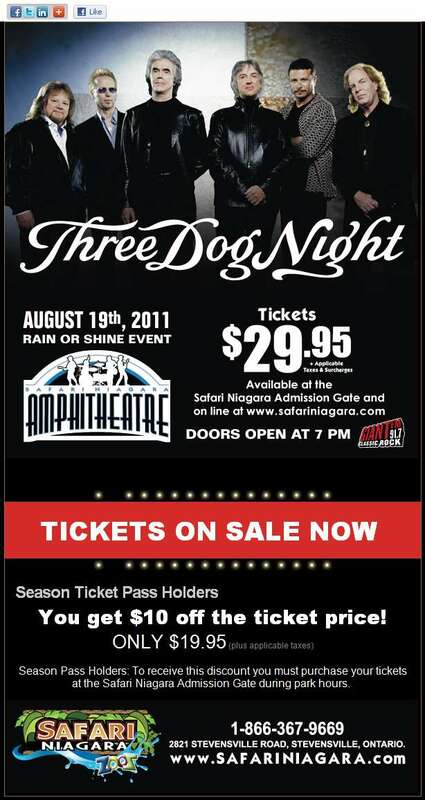 Three Dog Night Performing at Safari Niagara’s Amphitheatre! On Tuesday I received the following email newsletter from Safari Niagara. 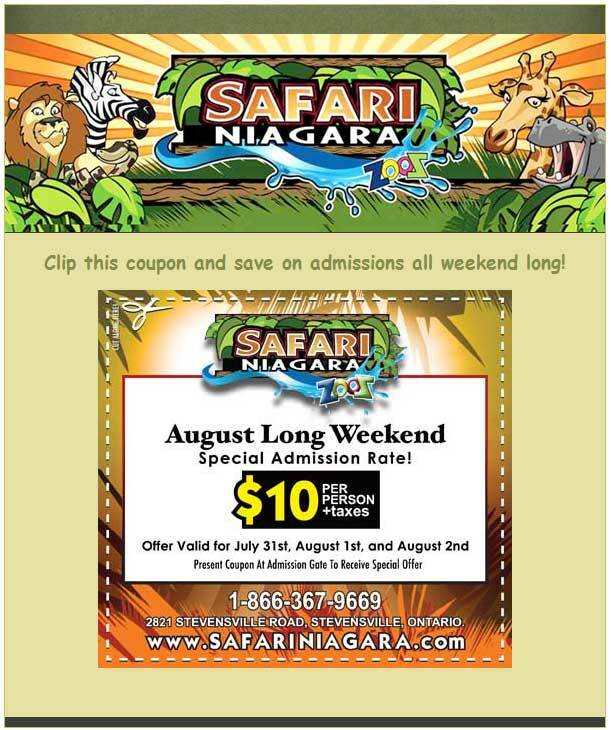 If you haven’t been to Safari Niagara, I’d recommend that you take advantage of this deal and give it a try. My family loves it! On Monday I received the following email newsletter from Safari Niagara. They are promoting the first in their summer concert series. Yesterday I received the following email newsletter from Safari Niagara. Dads are FREE on Father’s Day! On Friday I received the following email newsletter from Safari Niagara.